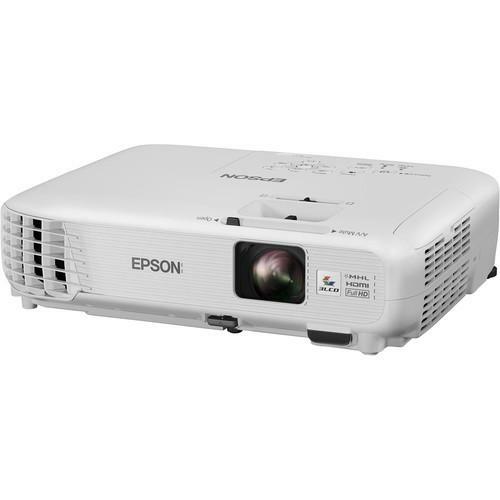 We recommend checking out our discussion threads on the Epson PowerLite Home Cinema 1040 WUXGA 3LCD Home V11H772020, which address similar problems with connecting and setting up Home Theater Projectors Epson. The user manual for the Epson PowerLite Home Cinema 1040 WUXGA 3LCD Home V11H772020 provides necessary instructions for the proper use of the product A/V Presentation - Projectors - Home Theater Projectors. The PowerLite Home Cinema 1040 WUXGA 3LCD Home Theater Projector delivers high-definition images along with 3000 lumens of white and color brightness. It's also equipped with a 3LCD, 3-chip optical engine and a 200W UHE lamp that provides up to 5000 hours of life in normal mode and 10,000 hours in ECO mode. This projector has an WUXGA 1920 x 1200 native resolution and has up to a 15,000:1 contrast ratio. Furthermore, the Home Cinema 1040 features a 1.38 to 1.68:1 throw ratio and can project images up to 300". With composite video, VGA, and dual HDMI inputs, this projector can accept a wide range of video sources. It also supports MHL connectivity via HDMI, which allows you to mirror and charge compatible connected devices such as smartphones and tablets. The Home Cinema 1040 also has a built-in 2W mono speaker for audio playback. Other notable features include a 1.2x optical zoom, ceiling mount compatibility, and the inclusion of a multi-function remote control. If you own a Epson home theater projectors and have a user manual in electronic form, you can upload it to this website using the link on the right side of the screen. Box Dimensions (LxWxH) 15.6 x 14.4 x 6.4"
The user manual for the Epson PowerLite Home Cinema 1040 WUXGA 3LCD Home V11H772020 can be downloaded in .pdf format if it did not come with your new home theater projectors, although the seller is required to supply one. It is also quite common that customers throw out the user manual with the box, or put the CD away somewhere and then can’t find it. That’s why we and other Epson users keep a unique electronic library for Epson home theater projectorss, where you can use our link to download the user manual for the Epson PowerLite Home Cinema 1040 WUXGA 3LCD Home V11H772020. The user manual lists all of the functions of the Epson PowerLite Home Cinema 1040 WUXGA 3LCD Home V11H772020, all the basic and advanced features and tells you how to use the home theater projectors. The manual also provides troubleshooting for common problems. Even greater detail is provided by the service manual, which is not typically shipped with the product, but which can often be downloaded from Epson service. If you want to help expand our database, you can upload a link to this website to download a user manual or service manual, ideally in .pdf format. These pages are created by you – users of the Epson PowerLite Home Cinema 1040 WUXGA 3LCD Home V11H772020. User manuals are also available on the Epson website under A/V Presentation - Projectors - Home Theater Projectors.